Although I'm a no frost girl, I can't deny how good the glide of the Sheer Matte Lipstick is. And even if it settles on my lip lines, the staying power is very impressive. I read that there are tugging feel when applying this but I didn't feel it. It actually swiped very well on my lips. Transfer is minimal. I advise that you exfoliate your lips well and get rid of clinging dry skin before swiping this on, or any other matte lipstick at that. Another plus is that it is not as drying as I expected it to be, given it's matte texture. 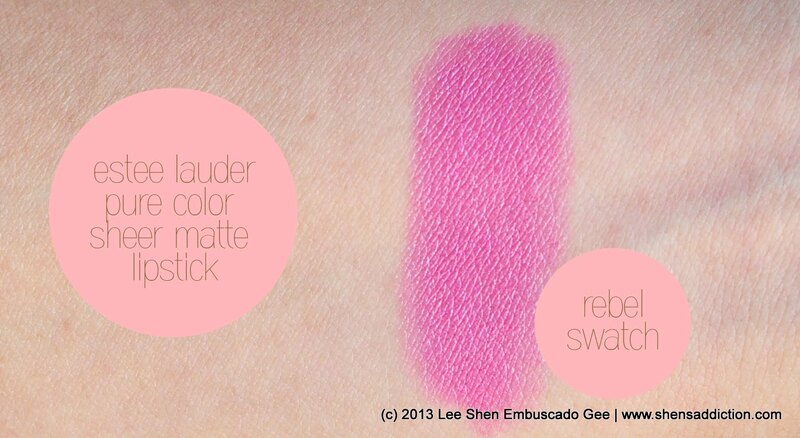 I'm not exactly sure why this is a sheer matte as well, since the shade, Rebel, is extremely opaque. Will I buy another Estee Lauder Sheer Matte Lipstick? Naked seems to be an interesting shades and I'm intrigued with the other shades. Unfortunately, the frosty finish is putting me off. I'm quite torn if I should pick up another given that matte is not something I like to sport during Summer. Get the new Estee Lauder Sheer Matte Lipstick at your favorite Estee Lauder counters in the Philippines.